Thai Airways has taken delivery of its first of 12 Airbus A350s. The aircraft, an A350-900, is on lease from US-based CIT, says Airbus. 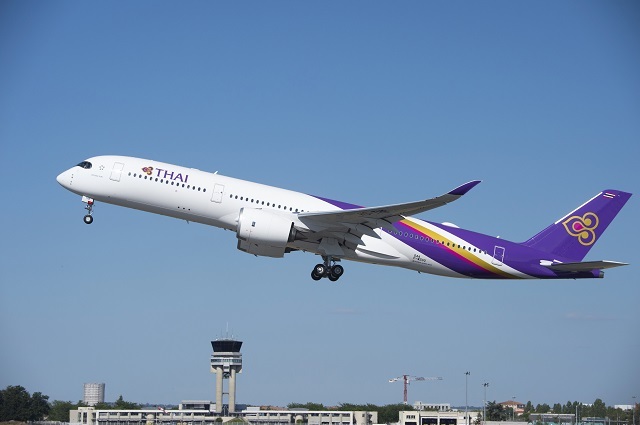 Bangkok-based Thai Airways becomes the eighth A350 operator. Flight Fleets Analyzer shows that aircraft of the type are already in service with Cathay Pacific, Ethiopian Airlines, Finnair, LATAM Airlines Brazil, Qatar Airways, Singapore Airlines and Vietnam Airlines. Thai’s A350-900 is fitted with 321 seats, 32 of them in a premium section. It will initially be assigned to a regional route between Bangkok and Chiang Mai. Thereafter, the aircraft will be deployed on long-haul services to Melbourne in Australia. Four of the Thai flag carrier’s A350s are being purchased directly from Airbus, says the manufacturer, and the other eight leased. Flight Fleets Analyzer indicates that CIT will lease a second A350 to the Star Alliance airline, while six will come from Kuwaiti lessor ALAFCO.